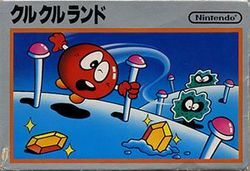 Clu Clu Land is a Nintendo game that was made available for the Famicom shortly after its launch in Japan, and was one of the launch titles for the NES in the United States. The core game play can best be described as a reverse Pac-Man. Rather than seeing every dot on the screen and needing to remove them, the player starts with an empty play field, and must proceed to reveal the location of every golden ingot. The differences don't end there, however. In Clu Clu Land, the player does not move the main character Bubbles (or Gloopy in Japan) directly through the maze. Instead, the player directs Bubbles to hold out her left or right claw and grab on to poles to swing around and let go when facing the desired direction. Bubbles can also fire a sonic wave that temporarily stuns the enemy urchins. Although "Clu Clu Land" is the official English title for the game, it should be noted that "Clu Clu" is actually a romanization of "Kuru Kuru", a Japanese expression that refers to something which goes "around and around". In order for Bubbles to move around the mazes, she must grab onto poles with her claws. When she holds on to a pole without letting go, she spins "around and around". Hence, this game could also be called "Kuru Kuru Land". Clu Clu Land has seen a number of re-releases, including an arcade version Vs. Clu Clu Land, a Famicom Disk System version, an e-Reader card package for the Game Boy Advance, and it was also part of the Famicom Mini series for the GBA in Japan. Bubbles is also a secret unlockable character in the Game Boy Advance game DK King of Swing. In the undersea kingdom of Clu Clu Land, evil Sea Urchins have pilfered all of the treasure. Only Bubbles, a red bubblefish, is brave enough to head out into Urchin territory and recover all of Clu Clu Land's gold. You control the red adventurer Bubbles on a journey through an underwater labyrinth filled with hidden gold bars, unseen traps and Black Holes. Be warned, evil Sea Urchins lie around every turn waiting to attack! As your enemies increase, the stakes get higher. Can you master the maze or will it master you? You control Bubbles through the grid with the control pad by holding Bubble's claw out to grab pegs and rotate around them. You must reveal every hidden golden ingot to advance to the next stage. You must avoid contact with the enemy urchins and blackholes. Press the button to fire a sonic wave that stuns enemies. Push the stunned enemies into the wall to eliminate them for bonus points. Cross from one side of the screen to the other when allowed. Watch out for invisible bumper barriers. In the bonus round, uncover every single ingot before time runs out for bonus points. Game Boy Advance Famicom Mini. This page was last edited on 10 February 2016, at 22:08.